It doesn't seem like a year since we were sat on Lytham Green for the Town's Club Day but time once again to take ‘Miss Jo’ to The Green. 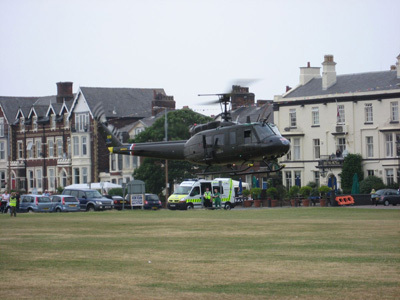 This year though there were some changes to the arrangements for us and we were to position the Huey to the west of the Windmill on The Green by the Lifeboat Station instead of the east as last year which meant we were much more central than 2008. We were also fielding one of Phil's latest acquisitions…. his Vietnam era jeep an M151 MUTT (Military Utility Tactical Truck). Jo volunteered to drive it to Lytham and Nina was to drive the WW2 jeep. They were our Ground Crew along with Sandy (and for the first time by Taggart!). Phil was to fly in Huey with Bradley and myself as Flight Crew. Saturday morning dawned bright and sunny and Nina, Bradley and I were on the road to Wesham at seven o'clock. Sandy too was making his way south from Lancaster whilst Phil had busied himself with checking out the weather, NOTAMS etc. On our arrival at Huey Base the Mutt was hitched up to the Huey and pushed it out into the field. Whilst Phil started his pre-flight checks the rest of us removed the wheels and 'a' bar and put them back inside. 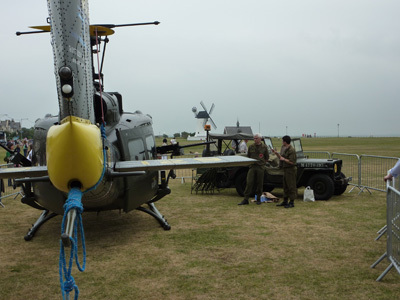 The jeeps were loaded with the chairs and hi-vis jackets, etc for the Ground Crew. Phil had arranged for a few of his guys from SMP to help out as well at the landing site as it was closer to the Town Centre and so potentially there could be more people around. All loaded up the girls headed off with Sandy and Taggart. Shortly after their departure we too were ready to lift from Base. Although it was to take the jeeps somewhat longer to drive to Lytham than us to fly, Phil was keen to take to the air to have a little more time to settle in behind the controls with it being a short flight. Shortly after 9 a.m. Phil pressed the starter button and the Huey started to come to life. As the power rose through 5% and then 10% the blades started to turn the power continuing to rise until 40% was reached and he released the starter as the engine could take over from here on in. The instrument panel was monitored to make sure everything was reacting the way it should. T&P's were good and everything was responding to Phil's inputs on the controls. Once he was happy he lifted 509 in to a murky Lancashire sky. Checking the aircraft responses again he slowly swung her round for the departure away from the Base. A call was put into Blackpool Tower to notify them of our departure from Base and to tell them we were flying to Lytham. Happy with that we were given the all clear to fly south to towards the estuary. Whilst talking to the Tower Phil had done a few circuits around the Base so was happy to head straight to Lytham to put the Huey on the ground before 9:30 a.m. From the time we had pushed the Huey out to lifting the weather had changed quite considerably from being crystal clear to being definitely grey and decidedly rain laden. No sooner than we had lifted we were flying up The Green to make sure we were happy with everything on the ground. We could see the hi-vis jackets of the Ground Crew around our allotted area and there was nothing else around to cause any issues. After turning around Phil lined 509 up for his approach directly off the estuary. 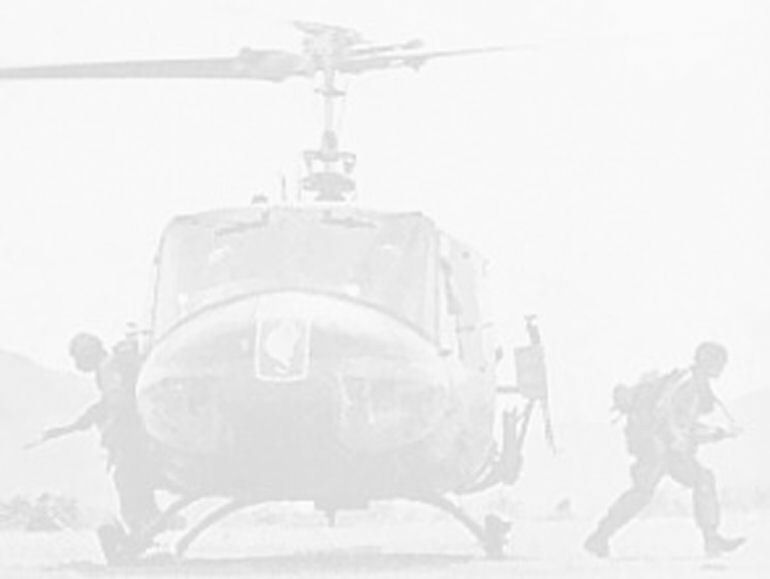 Reducing his height and his forward airspeed the Huey gracefully headed down towards the ground. Hover taxiing the big green machine closer to the road Phil swung the tail to the left to land with the nose into wind looking east along The Green. With time to spare ‘509’ was on the ground and engine wound down as Bradley prepared to tie the rotors down whilst the rest of us started to erect the barriers around the two jeeps and the Huey. As always at events like this the questions from expected bystanders started flowing thick and fast. As soon as the railings were in place the first of a steady stream of people came up for a closer look and a chat; something we all enjoy very much. Breakfast arrived in the form of coffee and bacon butties (many thanks to the Lytham Club Day Organisers) much to the delight of our mascot for the day, Taggart, who is Jo's Border Terrier and who suddenly became everyone’s best friend! He had travelled over in the jeep on Sandy's knee as Jo wasn't sure how he would react to travelling in an open topped jeep. As it turned out he thoroughly enjoyed himself and didn't once try to jump out!! Around 10 a.m. the Club Day Parade started to go past us on The Green and the girls went for a closer look leaving the rest of us to carry on talking to the people still looking at the big green machine. 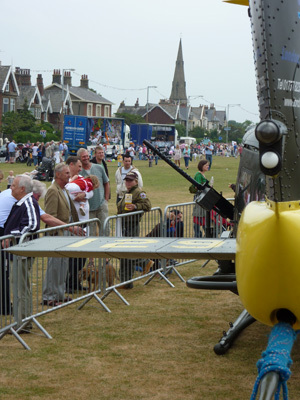 Well done Lytham Club Day…..what a fantastic Parade this year…..apparently the longest yet. The floats were very varied and colourful with evidence of much hard work being put in to get them ready for the parade with the spectators along the route cheering them on. 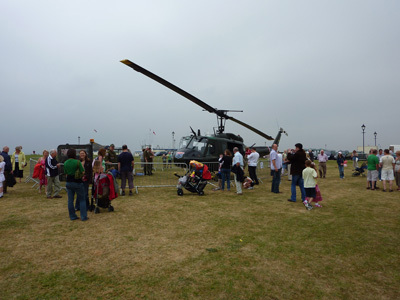 After the Parade had passed by, a number of the spectators approached the Huey. 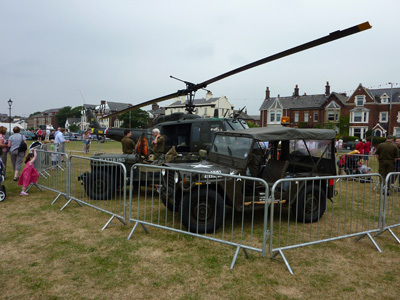 The favourite question of the day was ‘how did we get the Huey on The Green?’ closely followed with 'what time are you leaving?' when they were told we had flown in. It's a good job we're not the sensitive types otherwise we could get very upset with the second question but we know exactly what is meant by it so we don't take it personally. With the clouds getting darker to the east and heading our way it was decided to depart slightly earlier than planned. So we readied the Huey for flight with Phil again checking around the machine. 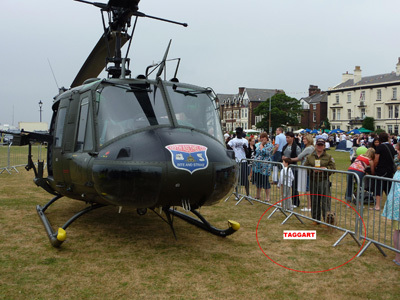 Whilst he did that we moved the jeeps out of the area and with the help of the local Police we moved the barriers and the assembled crowd back to a safe distance to make sure no-one would be under the Huey's departure flight path. The Ground Crew from the morning were to be the Flight Crew out so they were given their safety brief and seatbelts checked, all head sets were put on and the comms checked. Bradley and I did a final check around The Green inside the barriered area to make sure there was nothing that could cause a problem to the helicopter. Taggart and I retired to the jeeps whilst Bradley stood at the nose of the Huey. Shortly after 2 p.m. the high pitched turbine whine was to be heard over the expectant chatter of the crowd. Soon it was joined by the lazy ‘whomp whomp’ as the blades started to turn. The noise level steadily rose as the gas turbine picked up speed as did the rotors which began to produce the more distinctive thud that everyone knows. Bradley did the walk round checks to make sure the doors and inspection panels were secure. He also checked that there were no oil or fuel leaks. Happy all was OK he returned to stand by the nose to make sure Phil was happy. On Phil's signal Bradley ducked low and walked away from the machine leaving Phil's departure route clear. As Phil pulled pitch ‘509’ defied gravity and took off heading out towards the estuary with all those on the ground watching and listening intently as they could whilst being battered by the ensuing downdraught. Bradley and I watched the Huey until it was safely on its way down the estuary and back to Base before we jumped in the jeeps and headed home by road. The journey back was very pleasant driving through the back country lanes that took us through Wrea Green. As we drove into the centre of the village we were treated to a quintessential British sight of people sat outside the Village Pub enjoying a pint or two whilst others sat watching a game of cricket on the Green with the teams in their gleaming 'whites’. It was at this point it started rain, although admittedly not too heavily. Don’t you just love a British Summer! A few minutes later and we were pulling in to the yard. The Mutt was immediately hitched to the front of the Huey and she was jacked up on her ground handling wheels and towed safely in under cover. The Mutt and the jeep were then put inside. All the gear was sorted out and put back on the shelves. After a welcome cup of tea the BBQ was lit and we all sat down for an early evening tea ……….a fine end to an excellent day.